A new addition to the site, and one that every man can use. Hard-wearing, long lasting 1.25" poly webbing makes a super belt or utility strap. Find your waist size and all you have to do is choose Break Up, Obsession, AP Green, Max4, Tree Stand, or Xtra AP and you are good to go! The Belts come in three sizes, with at least 6" extra strap length beyond the black metal military buckle. If it's a little long, just snip it off for a custom fit. These are truly useful items for the sportsman, and we're proud to offer them to you at a great price. Buckles are imported, but the web and belts are made right here in the USA, Satisfaction Guaranteed! 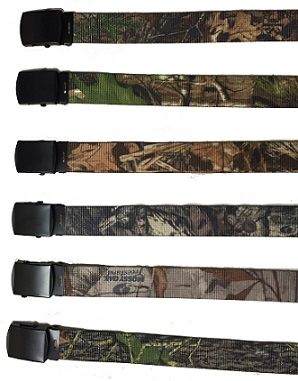 Patterns listed from Top to Bottom: XTRA AP, AP Green, Max4, Break Up Infinity, Tree Stand, and Obsession.